post war U.S. & Japan friendship as well as fun dining space. 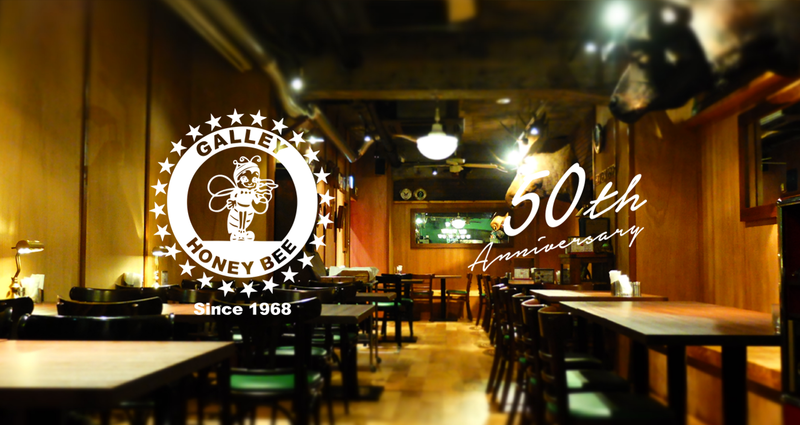 The founder of HONEYBEE, Haruki Naoi, opened “GALLERY HONEYBEE” in 1968, just across from Yokosuka U.S. Naval Base, utilizing his working experience as a chef in 1950s military canteen for U.S. military. “GALLERY” is a military terminology and means “kitchen” on vessels and airplanes. It was the time when U.S. military was fighting against Russia in Vietnam. Dobuita street was full of sailors, and so was CLUB ALLIANCE. The disco was located right in front of our restaurant and there were many soldiers dancing all night. Fights were often seen at night. Signs and displays were often destroyed. However, thanks to shore patrols and military police using our space to rest, HONEYBEE was a relatively “safe” spot in the area. At that time, the exchange rate between USD and JPY was ¥360/1USD. Many soldiers dropped their money in tip boxes and we needed to empty it at the end of the day. Our employees were counting on them since the wage was fairly low. There used to be a lot of restaurants in the area back then - “WICHITA”, “MOMMY SNACK”, “ANDY’S CAP”, “HANSON’S”, “PANDA”, “SNOOPY”, “HONEYBEE”. As time went on, however, Japan’s food culture were developed and became diverse, which made all other restaurants closed. Our American style menu was popular, and especially burger, chilli bowl, taco, Stick Dog (American dog), fried chicken, and french fries were taking off. The authentic flavors were loved by not only Japanese locals, but also Americans, and even nowadays we have been carrying the same recipe. 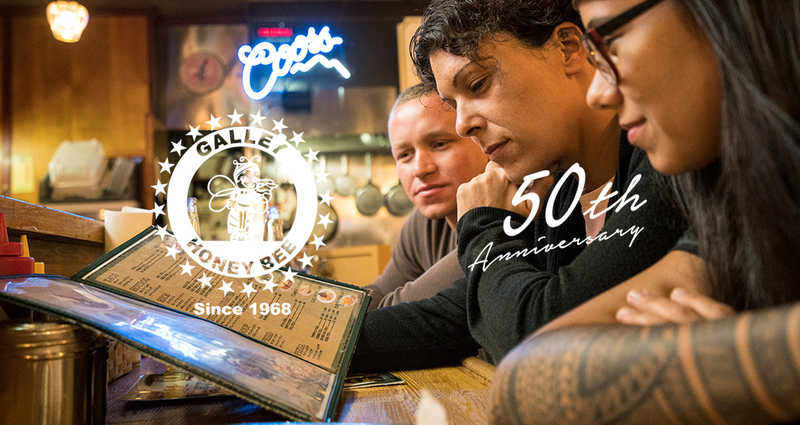 We’ve also spent years to improve every single menu, and here is today’s HONEYBEE. It is said that our Stick Dog was the first American dog that was sold in Japan, and Stick Dog has been very popular among customers. 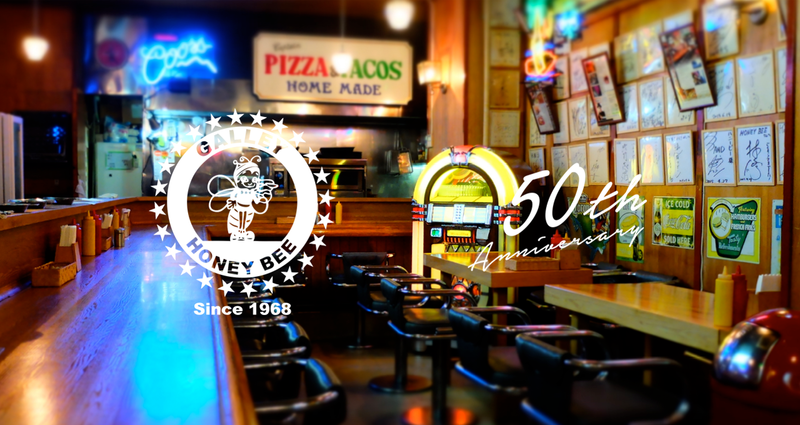 Our layout hasn’t changed ever since we opened, so you can feel the “original” HONEYBEE. A jukebox, Coca Cola’s sign, a pile of soft serve boxes and more are all covered with American colors. 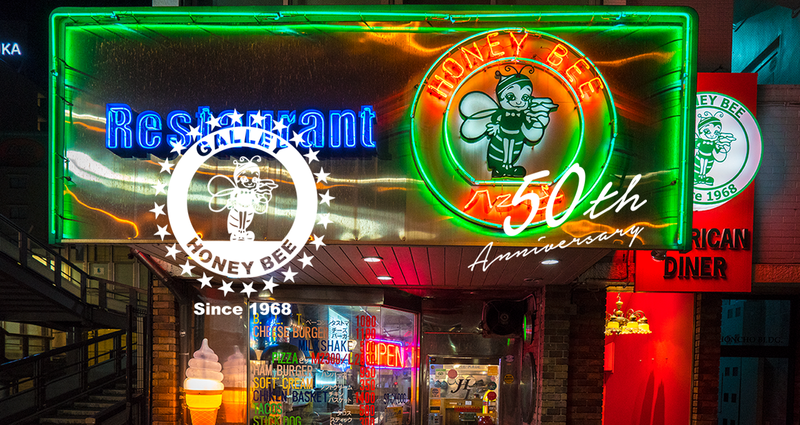 This may be the reason why HONEYBEE has been loved by so many people with different backgrounds – people who miss the good old days and people who visit Yokosuka for the first time.. Dining with us will take you to America while you’re in Japan. Hiroshi Fuse, Japanese actor, started his new life as a live-in staff with us as soon as he graduated from high school. While he managed to get on break, he loved eating this staff meal, “BLT” – sautéed bacon, lettuce and tomato on top of it. His favourite was to put on additional bacon and a fried egg, and then plenty of mayonnaise. We have been particular about this traditional way to cook burgers since opening. The first burger was made in the U.S. over 100 years ago. They were nutritious and eaten everywhere in America, and it was the same as for Navy. It was a precious menu for its easiness to eat when military people were at work. So we decided to make it a symbol of U.S. & Japan’s friendship, and we started selling “Yokosuka Navy Burger” as a local gourmet. 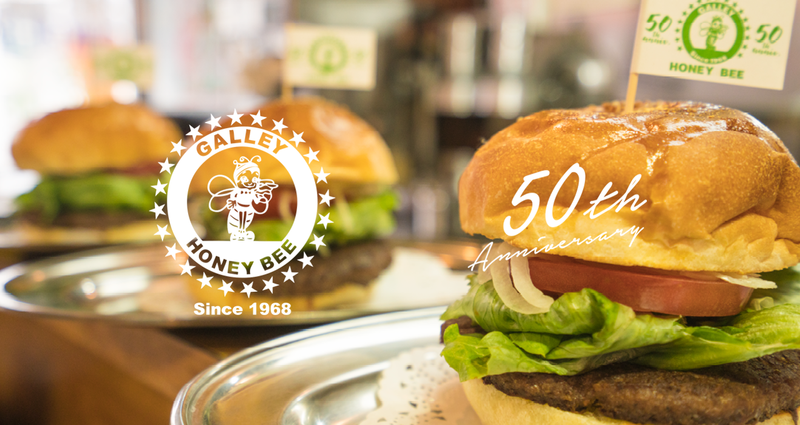 We, HONEYBEE, who know and love “American” burger more than anyone, became the first restaurant in the city to have been recognized by the city of Yokosuka, and the history of “genuine burgers” started. 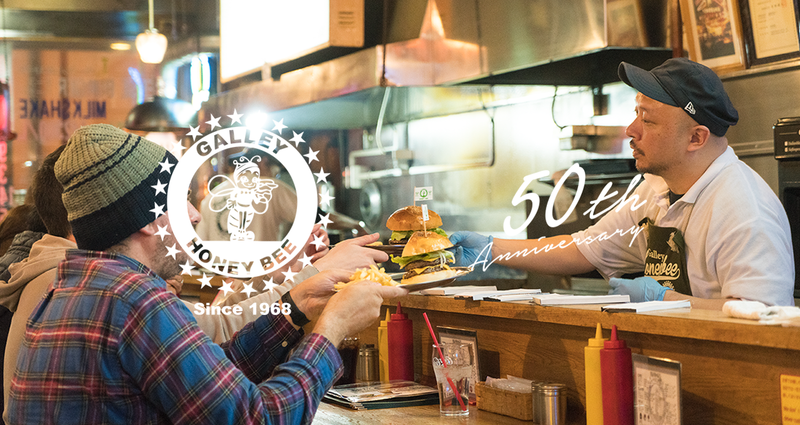 We will continue to maintain our traditional American style flavor which we’ve maintained since our opening in 1968, and we will aim that our secret recipe will be loved over next generations. The first burger was made in America over 100 years ago. You can either dine and eat at restaurants, or eat on foot and still it is delicious. This was the reason why burgers were loved by people. In the beginning of 20th century, U.S. Navy introduced “burger with strong coffee” as their menu for those who needed to stay at work for the whole day, and its easiness to eat and high nutrition made it precious. While authentic burgers are meant to be plain so it doesn’t ruin beef’s flavor, the chefs on each ship used their original ideas to make it different, and then military food was developed. In the late 1940s, when U.S. military brought their culture into the ‘far eastern land’, burgers were eaten by people who were there to listen to big band jazz music at EM Club near Shioiri station. It was the first time that burgers were tasted by the Japanese public. So people say Yokosuka was the original place that began the history of the burger in Japan. And nowadays, Char-cooked big American burgers by military people have been popular among locals who visit Yokosuka base on friendship day. In restaurants or at home, you may usually see burgers with a lot of ingredients and sauces to choose. However, our U.S. Navy based recipe values simplicity that doesn’t ruin the flavor of beef. We will expand our Navy Burger into the world! During Japan-Russia war, beriberi was an issue among Japanese Navy. To solve this problem, in 1908, commander decided to introduce the curry on “Kai-Gun Kappo-Jutsu Sankou-Sho” (Navy Culinary Book), and this meal was spread into the public. Curry has been the Friday lunch menu for Japan’s Maritime Self-Defence Force since then. Yokosuka Navy Curry is made based on its old recipe from over 100 years ago. The speciality is, “1) roux is made of fried flour”, “2) use either chicken or beef”, “3) chutney is a must”, “4) serve with pickles”, “5) serve with milk and salad” and so on..
We stir beef over 5 hours, and make roux thinner by using its juice. We also put various ingredients to make it western style. You can feel nostalgia and relief at the same time.